1. Break the egg on a bowl and beat them. 2. Add sugar depending on the amount you desire. 3. Add melted butter or vegetable oil to the mix. You can add milk and vanilla extract here too. 4. Then add flour and baking powder. 5. You can keep on adding flour and water until you arrive at the right consistency. Just make sure you will be able to pour it on a pan. 6. If you are mixing by hand, be sure to mix it for 100 times so it will be mixed well. 7. Then separate them into different bowls to add food coloring. 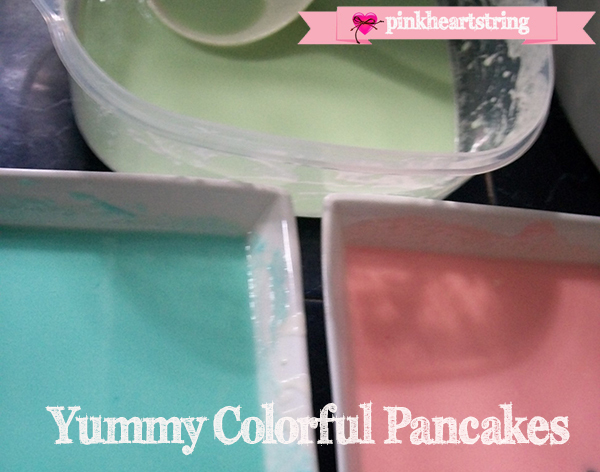 In my pancakes, I used pink , green and blue. You can have more colors if you want. 8. After that, heat your pan and your ready to cook your pancakes. In my case, I no longer placed butter on the pan for I placed oil on the mixture. But you can also place butter if you want to. Either way, it will still work. Just see to it that the pancake will not stick on the pan. Make sure not to press it while cooking so it can be fluffy. Just leave it until the top is quite dry before you flip it. You can also notice that the edges are starting to get brown. 9. Then you've got yummy colorful pancakes. 10. Top it with butter and sugar. You can also try using chocolate syrup! 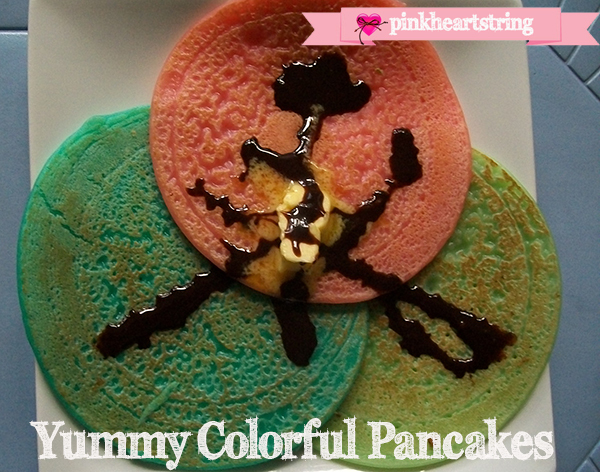 So, if your kids are kinda bored of the usual yellowish pancakes, then why don't you color them? You can also try using molders to have pancakes of various shapes. That would make your kid's snack time fun and healthy at the same time! Neat idea! My 3 year old is super picky, but I bet she'd eat the pink ones! Cute! We eat lots of pancakes here, so it would be fun to try colors! @Olivia: My daughter likes the pink pancakes too! @Meghan: These are cute especially if you use different colors. Thanks for dropping by! Hugs!